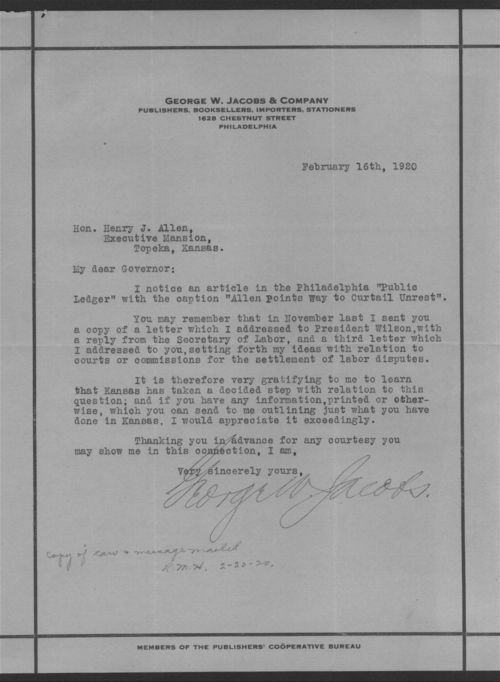 Publisher George Jacobs of Philadelphia, Pennsylvania, writes to Kansas Governor Henry J. Allen of Topeka, Kansas, about the recent creation of the Kansas Court of Industrial Relations. Jacobs had earlier suggested the creation of a state and national court system designed to settle labor and capital disputes. In this letter, Jacobs requests further information about the Kansas law and thanks the governor "for any courtesy you may show in this connection."